If you have had any interaction with the cryptocurrency ecosystem, you will have noticed that centralised exchanges continue to play a critical role in the industry to the point where they are almost unavoidable. Despite the many enticing promises of blockchain, to enter into this new world and be part of bringing about the technological and social change which is fast approaching, we all must first use these exchanges. They act as the gateway between the traditional world and the explosion of new innovation, and offer highly liquid order books to exchange currencies and tokens instantly. The problem is that we must trust them with control of our currencies and personal data — the very things blockchain promised to help us regain control of — and because of this, these exchanges have also gained a disproportionate amount of power. Most of us have experienced the powerlessness that relinquishing control brings — through frustrating deposit and withdrawal delays, appeals for help to customer support agents and long waits, and in the worst cases, by losing funds in some of the many hacks and breaches which target these centralised honeypots. In light of this, we’re launching the first trading solution designed to empower community members and return them control, without having to sacrifice the benefits which centralised cryptocurrency exchanges provide: Ethfinex Trustless. With Ethfinex Trustless there are no signups, no deposit or withdrawal delays and no sacrificing custody of your tokens. Users retain full control of their funds throughout the entirety of the trading experience whilst executing trades against a highly liquid off-chain order book to ensure an entirely seamless trading experience. The Bitfinex order book is a crucial part of what makes the Ethfinex trading experience unique in the decentralised exchange space. With one of the most liquid order books in the crypto space, users can now take advantage of a high-liquidity, low-spread trading experience without sacrificing the control that this movement is founded upon. With an overarching vision of decentralising trading solutions on a global scale, Ethfinex allows for seamless trading through means of Ledger and MetaMask, providing trustless, anonymous and high-liquidity trading solutions to over 57 Ethereum based tokens. Get trading immediately. We don’t want your name, email, phone number or address. Maintain full control of your funds at all times by connecting directly via MetaMask, Ledger, Trezor or Keystore. Trading cryptocurrencies does not have to involve counterparty risk. 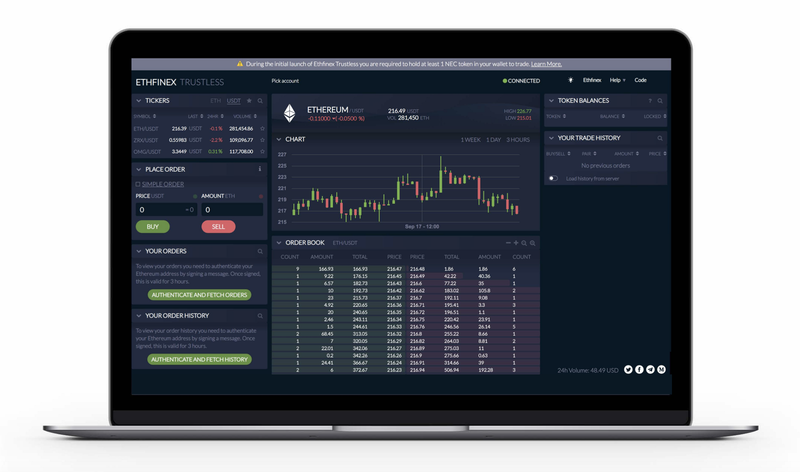 Ethfinex Trustless allows you to trade directly against the Bitfinex and Ethfinex order books, removing the liquidity constraints associated with current decentralised exchanges. Eliminate the stress and waiting associated with current trading experiences. Connecting via your wallet removes the need for deposits & withdrawals whilst our off-chain matching system ensures instantaneous order execution. Over the past 12 months, there’s been an entire category of decentralised exchanges that have emerged, each approaching the potential of trustless exchange in differing ways. For Ethfinex, the community that surrounds the exchange is paramount and feeds into our vision for a trustless portal. Powered by the Nectar (NEC) token distributed to traders on a monthly basis, our vision is to provide Ethfinex users with the tools to collectively govern the operations of the exchange. This involves democratising the decision-making of the platform amongst the users who make the platform what it is. Starting with listings, this will soon progress to encapsulate fee structures, margin decisions, user incentivisation models and profit distribution decisions. Following a successful roll out week, 40+ tokens including Dai pairs will be added. The architecture is currently designed so that it can also seamlessly upgrade to use the new 0x V2 smart contracts once they have been thoroughly tested. The trustless portal is a first step towards building a decentralised trading platform. Through removing the array of concerns associated with current centralised entities, Ethfinex aims to power a new era of digital asset trading — an era in which security, privacy and liquidity is placed in the hands of the user. Visit Trustless.Ethfinex.com to get started. Update: After our rollout last week, NEC is no longer required to trade and we welcome all to connect a wallet and start trading!